Arabs open illegal and dangerous parking lot, expand onto private Jewish land, authorities turn a blind eye. Arabs running a parking lot near central Samaria's Barkan Industrial Park have encroached on privately owned Jewish property, claiming it as their own. Thousands of Jews and Arabs work in the Barkan Industrial Park, and are charged only 10 NIS ($2.87) per day to use the parking lot. It is not clear who authorized the Arabs to charge hundreds of cars each day for parking on public land. In addition, the lot's location presents a severe traffic hazard, since its entry and exit created an illegal junction on a main highway, endangering commuters' lives. According to the Civil Administration's information, the parking lot was built without a permit, and its area continues to grow gradually as Arab tractors prepare more and more land for parking. When a representative from the Regavim Movement arrived at the site, he found that its latest "expansion" included part of a privately owned plot of land. Regavim had previously contacted the Civil Administration in an attempt to prevent the lot's expansion onto private land, demanding supervision and law enforcement. However, the Administration answered laconically, saying it would add the complaint to the list off issues with which it has to deal. After the latest expansion included private Jewish land, Regavim contacted the Civil Administration a second time. 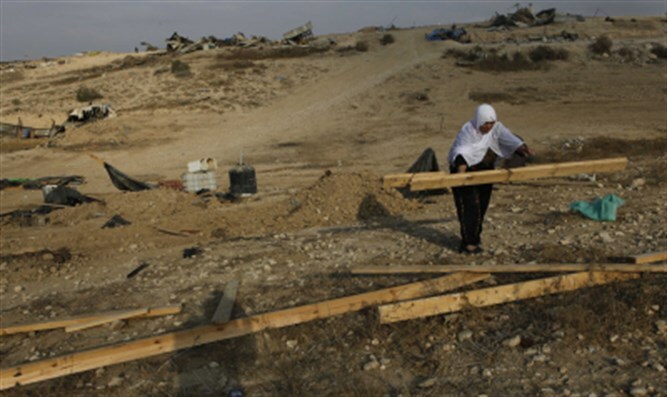 "As we have seen, more than once, when there is a complaint of illegal Jewish construction on Arab-owned land, it always claims top priority," Regavim attorney Avi Segal said. "However, it would be fitting for the Civil Administration to take those same steps when the invaders are Arabs, taking over private Jewish land." Samaria Regional Council Head said, "We expect the relevant authorities to do their work and protect the Jewish landowners' rights. Every inch of land in Judea and Samaria taken over by hostile Arabs negates the State of Israel's interest in protecting its lands and it is even worse when private Jewish land is usurped. I call on all the relevant authorities to do their jobs and stop these criminals."